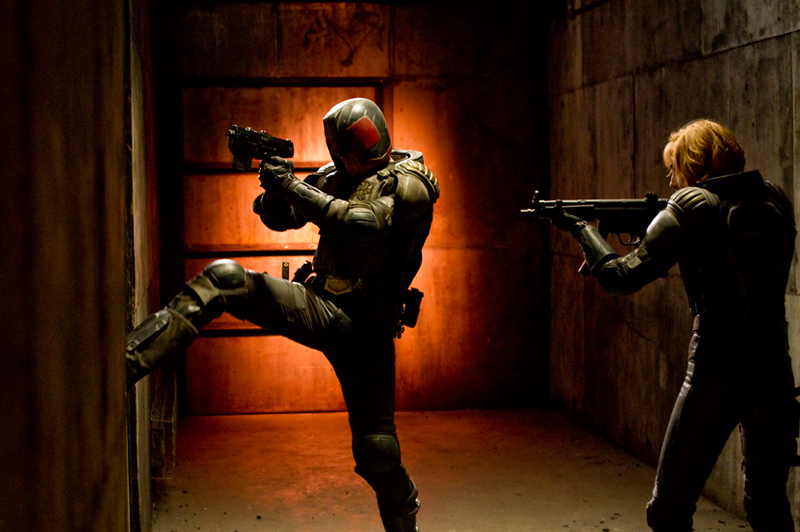 Dredd is an extremely violent science fiction action movie that is also very faithful to its comic source. For fans of either genre, it’s worth watching. Comic fans will also appreciate the mini-documentary on the source material included in the home video release. Judge Dredd was created by John Wagner and Carlos Ezquerra in 2000 AD in 1977. In a nice touch, that’s the very first of the end credits, before even the actors’ names appear. The movie is faithful to the mood of the comic, showing a dirty instead of shiny future, focused on the underclasses. This is not a film for you if you object to gore, since they aren’t shy with the shootings, and there are some truly gross executions. The moviemakers took the R rating seriously. Impressive visuals open on the huge scope of Mega-City One, alternating with Judge Dredd (Karl Urban) suiting up as the comic book character who’s judge, jury, and executioner. You can tell the movie was framed for 3-D in certain action frames or the credit sequence. Lots of high-angle shots occasionally gave me vertigo. The performance by Urban, with his gruff, firm voice, is excellent. 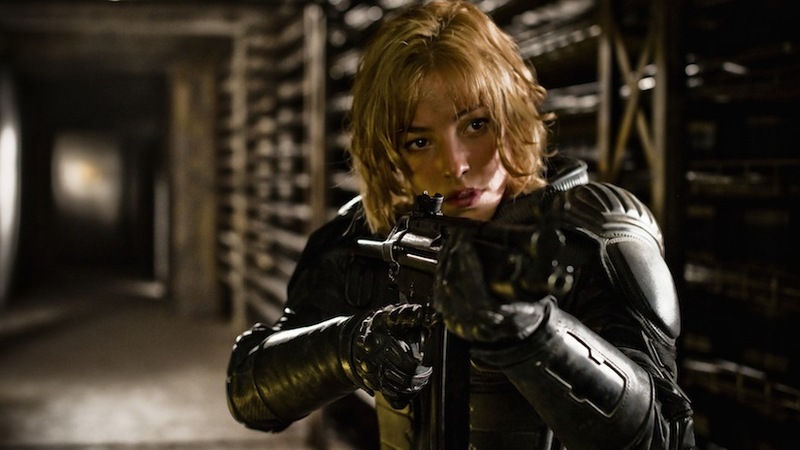 Dredd is given one day with the on-probation Judge Anderson (Olivia Thirlby) to determine her fitness for the job. She doesn’t wear a helmet, because it blocks her psychic abilities, but he never takes his off (unlike the previous film version of the character). The armor is a realistic take on the exaggerated comic visuals, keeping the key elements — helmet, badge, gun. Lena Headey plays a scarred drug kingpin who’s dealing slo-mo, a drug that affects time perception, leading to slow-motion drug scenes. She throws three rivals to their deaths inside a giant apartment block. When the judges come to investigate, she takes over the building’s security and locks it down. The two judges are sealed inside with a murder suspect in tow, trying to stop the crazy boss villain while all the minions are hunting them. It’s like Die Hard on steroids in a cat-and-mouse game. The plot is a good choice to keep the focus on the characters and their life-and-death decisions. Dredd will be available on Blu-ray (list price $39.99), DVD (list price $29.98), digital download, and pay-per-view on Tuesday, January 8. The Blu-ray has both 3-D and regular versions on the same disc (the only one in the package). If you don’t have 3-D functionality, you’ll get an on-screen message telling you that before the standard version starts. I like the simplification of only having one choice to buy — too many studios put out too many confusing packages. * “Mega-City Masters: 35 Years of Judge Dredd” (14 1/2 minutes) — Carlos Ezquerra, Brian Bolland, John Wagner, Mark Millar, and others talk about the history of 2000 AD and its flagship character. * “Day of Chaos: The Visual Effects of Dredd” (15 1/2 minutes) — Includes discussion of 3-D and slow-motion filming techniques. * “Dredd” (2 minutes) — Hey, we finally get to see Karl Urban’s face! He explains the character to us briefly in what feels like a pumped-up trailer. I hadn’t realized he had an accent (which doesn’t appear in the film), since he’s from New Zealand. * “Dredd’s Gear” (2 1/2 minutes) — How the costume was assembled and what it means. * “The 3rd Dimension” (2 minutes) — Working with 3-D and what they were trying to do differently with it. * “Welcome to Peachtrees” (2 1/2 minutes) — About the set and location.